If you are in the Washington, D.C., area this summer, consider taking a drive down south, to the southernmost point on Maryland's western shore to be exact. Here, you will find a treasure trove of interesting geology, as well as spots rich in colonial and Civil War history. Located in historic St. Mary's County, Point Lookout, Md., is about 70 miles south of Washington, D.C. Reaching Point Lookout by car from I-95, via the capital Beltway, is a 75-minute drive. You'll also use Route 5 and Route 235 through scenic and historic southern Maryland. Point Lookout, Md., has beautiful coastlines along the Chesapeake Bay, where recreational opportunities abound, including boating and fishing. The region has a rich geologic and cultural history. All photos by John Rowland. 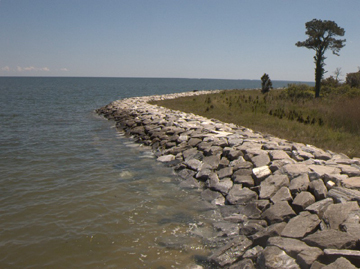 Point Lookout is the site of the confluence of the Potomac River and Chesapeake Bay. Along the drive south, you will see fields, ponds, marshes, creeks and farmland where corn, soybeans, wheat, and tobacco are the traditional crops. The region is also renowned for its bounty of shellfish, especially the blue crab. And St. Mary's County is also home to a substantial population of Amish, where horse-drawn buggies are common, especially near the Amish farmer's market. In addition, several excellent marinas are available, as well as opportunities for "Skipjack" tours and fishing boat charters. The region has a colonial history going back to March 1634, with the settlement of Maryland that began with the arrival of passengers from England at St. Clement's Island in southwestern St. Mary's County. The 134 settlers, led by Lord Leonard Calvert, arrived ashore on March 25, 1634, after sailing from the Isle of Wight on the ships the Ark and the Dove. March 25 has become known as "Maryland Day." Once you get to Point Lookout, you can see the remainder of one of the three large manors owned by Lord Calvert. Prior to the U.S. Civil War, Point Lookout was a beach resort providing a relatively easy escape from Washington, D.C. During the war, in 1862, the U.S. government established a hospital to help treat the mounting number of war casualties. By 1863, the camp and hospital began to accept POWs. The numbers swelled over the next two years to more than 52,000. Tragically, nearly 4,000 Confederate POWs died from disease by 1865 at Point Lookout. The monument in the small park at the side of Route 5 at Point Lookout citing their names and home states represents the only instance of a federal monument to honor Confederate soldiers. Point Lookout is now most famous for its hardhead, blues, rockfish, trout and flounder. Be sure to check out the local fishing piers and recreational swimming areas. Also, make a trip to the Point Lookout Lighthouse, which was active for 135 years until 1965, when the U.S. Navy purchased the property and automated the light. Since then, the property has gained notoriety as a haunted site. Numerous visitors to the area have claimed encounters with "spirits," some of which are attributed to deceased Civil War soldiers or Laura Berg, a light keeper at the station. Point Lookout State Park holds a very popular "Ghost Walk" for the public in late October. 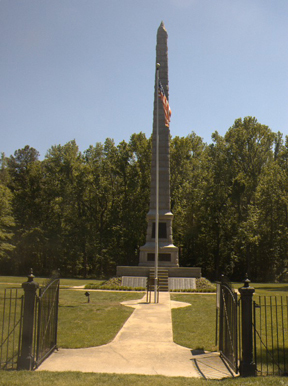 federal memorial in the United States for Confederate soldiers. While looking for ghosts and eating fish, however, do not forget about the region's interesting geology. Southern Maryland, including St. Mary's County, is the "coastal plain." Due to low topographic relief and a high groundwater table, wetland areas are common throughout the area. Forested wetlands are found on floodplains along the freshwater tidal and nontidal streams, in upland depressions, and in broad flat areas. The wetlands provide flood buffering, erosion control, bank stabilization and water-quality improvement, as well as a great spot for wildlife watching. Tidal and nontidal freshwater marshes are habitat for birds, mammals, crabs, oysters and other aquatic wildlife. The area's maritime forests and marshes are home to red fox, white-tailed deer, opossums, cottontail rabbits and raccoons. Several types of turtles, including snapping turtles, painted turtles and diamond-backed terrapins, frequent the Point Lookout area. Among the more scenically impressive coastal locales is the St. Mary's River situated near historic St. Mary's City and the campus of the St. Mary's College of Maryland. This site is about 10 miles north of Point Lookout on Route 5. Typifying southern Maryland's coastal plain characteristics, this area's landscape varies from flat in the tidewater to rolling with low scarps and dissected hills. Since about 3,000 B.C., the area was occupied successively by the Piscataway, Algonquin, and Susquehannock tribes. The broad expanse of water off Point Lookout provides ample opportunity for a storm coming up the bay to develop a formidable fetch prior to landfall on the western shore. Hurricane Isabel struck the area in September 2003 causing substantial damage to trees, bulkheads, piers and beaches, and even turning up new fossils, including a giant whale (see Geotimes, May 2004). Consequences of that storm's impact emphasize the vulnerability of the area to damage from future nor'easters and hurricanes. The Point Lookout region is susceptible to erosion, as storms can gather strength as they travel into the Bay. The region is also vulnerable to sea-level rise, putting the nearby Calvert Cliffs fossil beds at risk. This vulnerability also may be increasing, as researchers at the U.S. Geological Survey (USGS) and Maryland Geological Survey (MGS) indicate that the local sea-level rise rate is increasing. The average rate of sea-level rise in the state is between 3 and 4 millimeters per year or 1 foot per century  a rate nearly twice the global average. An accelerating rate of sea-level rise by 2100 could result in 2 to 3 foot higher water levels than today. In addition to coastal flooding and sea-level rise, portions of Calvert County, specifically the coastal cliffs and surrounding hills, are susceptible to erosion and mass-wasting. MGS and USGS indicate that cliff erosion rates at Calvert Cliffs are about 1 to 2 feet per year due to undercutting waves, wind, and mass-wasting. These cliffs, a few miles north of the Solomons, are famous for collecting fossil shark teeth and mollusks. The Solomons area is just a quick stop on your ride home, only 25 miles north of Point Lookout, and is highly recommended. 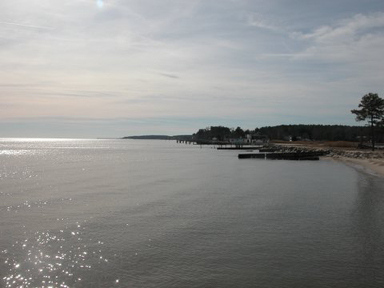 The town has a great reputation for seafood and scenic vistas of the Patuxent River and Chesapeake Bay. The Calvert Marine Museum has an extensive collection of Miocene-aged (23.8 million to 5.3 million years ago) fossils from the nearby Calvert Cliffs. Although several areas of the cliffs are closed to the public, local public beaches are accessible and can be rewarding for fossil collectors, with abundant fossils of several species of shark, rays, clams, snails, fish and turtles. Fossil shells are usually thicker and white to gray in color, while the fossil shark teeth are, well, rather obvious in appearance. The shells are a nice souvenir to show off when you return home from your southern Maryland geology adventure. Rowland teaches geology at the Environmental Science & Policy Program at Johns Hopkins University in Washington, D.C., and at the Univeristy of Maryland in University College.